(left) Ruby Lin and Richie Ren, and (right) Blackie Ko and Richie Ren in Life Express. The Skinny: Well-meaning but unsubtle, Blacky Ko's final film should never be confused with anything more than an uneven exercise in outright audience manipulation. Still, the loaded storyline pulls the right strings, and for a few brief, somewhat bizarre moments, the movie literally soars. The final film from ubiquitous character actor/stunt driver Blacky Ko Sau-Leung, Life Express certainly fits the description for well-meaning cinema. A country-hopping drama about the race to save one little boy's life with a bone marrow transplant, Life Express could be prime fodder for movie of the week status on the Lifetime network, and as such is a hard movie to deride. Indeed, much of the drama is preprogrammed to affect, such that being overly-critical of the film would be like kicking Puss in Boots from Shrek 2 when he does that cute doe-eyed stare. Most audiences will likely forgive the fact that the film is uneven, and pretty much a textbook exercise in audience manipulation. For more discerning audiences, at least the movie doesn't bore. Richie Ren is the required big name in Life Express. He plays Kao, a hotshot Taiwanese surgeon who works primarily on bone marrow transplants, and also rides to work on his mountainbike in cool, kickass BMX style. His co-worker Yan Yan (Ruby Lin) is also his girlfriend, and has promised to marry him after he's saved the life of twenty people who need bone marrow transplants. Kao is up to eighteen such successful surgeries, so it looks like Yan Yan may be Mrs. Kao sometime pretty soon. But first, they need two more successful operations, which only can occur when rare matching donors for the afflicted are found. The deal is: Kao removes the bone marrow, Yan Yan arranges transport, and Kao handles the transplant. They're the ultimate popstar life-saving team this side of the Twins, who've probably cured mass suicide with their sheer cuddliness. But we digress. While Doctor Kao and Yan Yan are hemming and hawing over marital plans, a medical crisis erupts in Shanghai. Young Luk Fei (Liu Ci-Hang) falls ill, and is diagnosed with Type-4 Hemophilia (Ed note: that's what the subtitles say. Nobody who works here went to med school, so if the info is erroneous, we wouldn't know.). He needs a bone marrow transplant, but the only compatible donor is a Taiwanese convict (director Blacky Ko) who isn't so keen on getting his bone marrow sucked out. Yet. 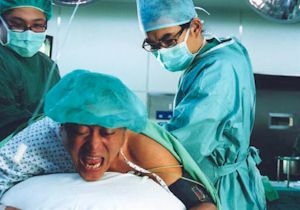 Meanwhile, Luk Fei's mom and the doctors struggle mightily with the truth of the illness, which includes the low chances of finding a compatible donor, and the ugly realities that come with treatment (chemotherapy, losing one's hair, etc.). Luk Fei also meets similarly afflicted children who are still waiting for their transplants. All that the child has to keep going is his desire to one day be a star football (AKA: soccer) player like David Beckham. Could this film be any more manufactured? The answer to that: probably not. Life Express seems written from a blueprint of obvious drama that could only piss off hopeless curmudgeons or people who just have a problem with medical dramas. Every character in this film is a recognizable type, and the actual nuts-and-bolts conflict (A kid will die unless people struggle to save him!) is so inherently loaded with expected pathos that yawning while sitting in the audience would probably invite public scorn, or perhaps a sound beating by more sensitive people. Life Express pushes all the required buttons with machine-like efficiency; at the very least, Blacky Ko doesn't offend with his obvious drama, though there are some syrupy moments that go so far as to be laughable. However, laughing is another action that could incur public scorn, or again, a sound beating from more sensitive individuals in the audience. Who knew watching Life Express could be hazardous to your health?